For many people in the southern Yukon, spring is the time to get back in touch with some of the reasons that we live here. Those complex reasons usually include the close communion with Nature that is not only possible, but essential to an understanding of life in the North. For us, the arrival of spring is heralded by the swans - the Trumpeters and Tundras (formerly called Whistling swans) who arrive at the first patches of open water in April. For a few weeks, until they continue on to their breeding grounds further north, they are the most majestic, and under certain conditions ethereal, of our spring neighbours. For untold centuries, the swans have been honoured for their spiritual power, and their arrival prompts a "Celebration of Swans" at Whitehorse and at Marsh Lake, their main staging spot in this area. On Lake Bennett, where I live, the swans generally arrive a week or two later - in 2002, the first arrivals were on April 21st, in 2003 they came on April 6th. Historically, swans were common across most of North America except the furthest south areas. Wintering from the Sacramento Valley to the Gulf Coast, hundreds of thousands of birds would wing their way north in the early spring, passing over the southern Yukon enroute to their breeding grounds on the tundra. The southern Yukon is one of the very few places where Trumpeter and Tundra swans can readily be seen on the same body of water. Although the Tundra and Trumpeter swans look very similar at a glance, the differences are fairly obvious if you spend some time near them, and even while they are far overhead, their voices are dramatically different. The original peoples of the southern Yukon hunted swans (dägäy - pronounced "duhguhy" - to the Southern Tutchone) with bunting arrows; their meat was highly regarded, and parts of the bird were used for a wide variety of purposes. Swan breasts could be stitched together to make luxury items including bed robes (which took about 12 breasts to make) and party dresses and hats - due to the obvious difficulty in keeping them clean, however, such items were only used for very special occasions. Swan's feet, once they were softened by rubbing them with grease, were made into tobacco pouches; beavers' feet were also used for this purpose. As well as the more "physical" uses for swan products, the spiritual power of the swan played an important part in the lives of many of the Native groups. Catherine McClellan reported that some Inland Tlingit shamans had swans as their "doctors," and the feet, necks and heads of swans were used as containers for "the ceremonial swan's-down which is a necessary part of shamanistic equipment." Amulets made from specially prepared swan's-down were often given to people with minor ailments (the down was given special powers during an 8-day fast by the shaman). During some traditional dances, swan's wings would be waved by the dancers. Girls entering puberty had several uses for ceremonial items made from swans. In the Tagish, Tutchone and Inland Tlingit groups, a girl who reached puberty would drink water from the shell of a diving duck, using drinking tubes made from swans' wing bones; she would thus be guaranteed to be light on her feet, and to have easy pregnancies. To ensure that her hands and limbs were flexible and strong for work, she might also wear sinew twisted with swan's-down around each finger, and as arm-bands and garters. When a baby was born, "the child's navel string was mixed with some swan's-down and put into a circular beaded case sewn by the proud new mother..." (McClellan). As well, there was no bag limit on migratory birds, including swans, until 1938, when the Territorial regulations were tied to the Canada/United States Migratory Bird Treaty, which had been in place since 1916. Although the threat to the swan population was officially recognized in 1916, regulations were weak, and were particularly ineffective in the Yukon and Alaska, which made few moves to protect swans in particular until the late 1930s. By the 1920s, there were only about 450 Trumpeters left in the 48 States, and in 1935, the population was down to a critical 73 birds. The population of Tundra swans in North America is stable at about 110,000 birds, and several states in the eastern United States are working at re-building their populations of Trumpeter swans, partially through removing eggs from active nests in Alaska, where approximately 8,000 birds now spend the summer. 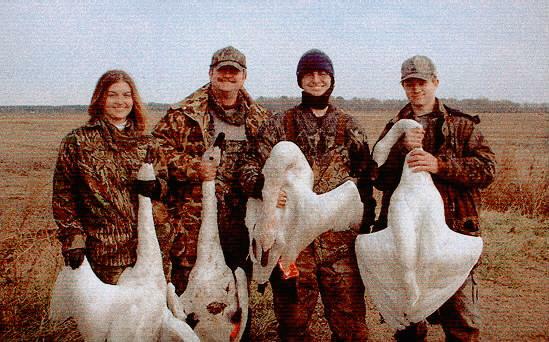 Hunting of tundra swans is still a prestige sport in many areas, but as the number of swans increases slowly but surely, more and more people across the continent are being treated to the sight of these magnifent birds, not in park lagoons, but in their natural element. Body: Both Trumpeter and Tundra swans have pure white feathers, with black feet and legs. Male Trumpeters (cobs) average 26-27 pounds, with females (pens) averaging 20-22 pounds; Tundras are smaller, at 15-16 and 12-13 pounds respectively. The necks of Trumpeters are much longer in relationship to their bodies than those of Tundras. Bill: The most useful identifier in the field is the bill; Trumpeters have all-black bills, while most (although not all) Tundras have a small yellow patch in front of the eye. As well, Tundras have more sloping bills. Click on the chart to the right (from the National Audubon Society's excellent book The Sibley Guide to Birds ) to enlarge it. Voice: The sound of the Tundra swan has been described as a low blowing or tearing sound (click here to hear it), while the deep note of a Trumpeter is most commonly compared to a French horn (click here to hear it). Head Movement: Trumpeters frequently bob their heads and necks up and down, usually vocalizing while they bob; this usually occurs just before they take off when disturbed. Tundras do not exhibit this behaviour. Alarm: Trumpeters do not spook as easily (one of the reasons for their near extermination, and for the fact that most swan photos are of Trumpeters). In mixed group, the Tundras may take flight a minute or so earlier. ©2003-2011 Murray Lundberg: Use for other than research purposes must be approved by the author.